Lorand Minyo, SimpliQ’s EVP, released last night the first monthly briefing for SimpliQ Media & Technology 2008. Have a ball reading it here. What we’ve been up to, some pictures from the office, and no, don’t believe him when he says he is the Darts Cricket undefeated champion… He is just bragging, and I had some bad days. But go on reading! Manafu opened a blog a few months ago, where bloggers would post pictures with their desks. Of course I had my desk from home placed there, but I seldom use that desk anymore, and it was time to post a picture with the place I blog from. 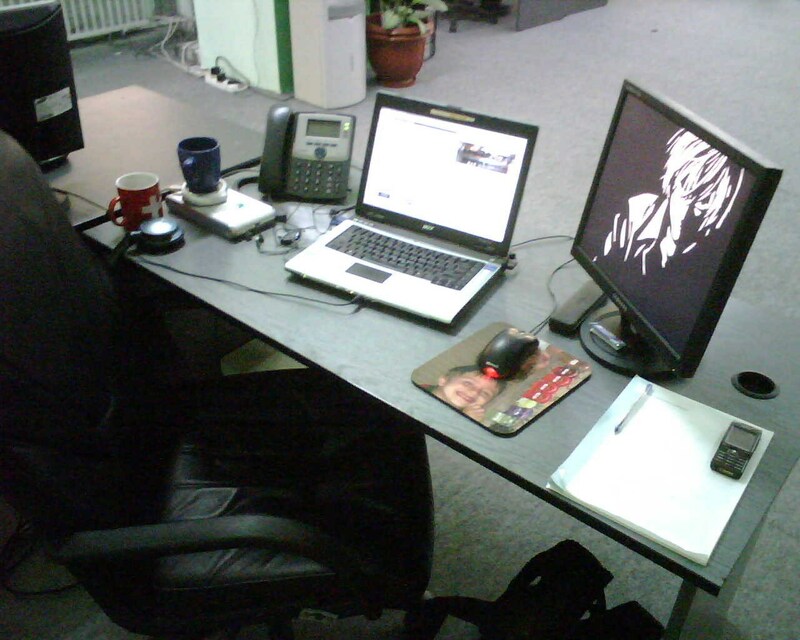 It’s my desk at SimpliQ Media & Technology, the company I work for. What do you think about it? Explanations of the pic on my Flickr photo stream here. PS: Photo was taken with a blackberry not quite in excellent conditions. My camera batteries went dead when I tried to start it. I really need to remember to load those.